While I was in Melbourne, I set myself what I thought would be a simple task. I was to find a photograph of my my grandfather ‘Scottie’, who had been a typewriter mechanic for over 40 years. However in doing so I made a discovery that left me re-thinking much of my families history, and made me confront some very difficult memories of my own. John Lavery couldn’t picture my grandfather’s face in his head. 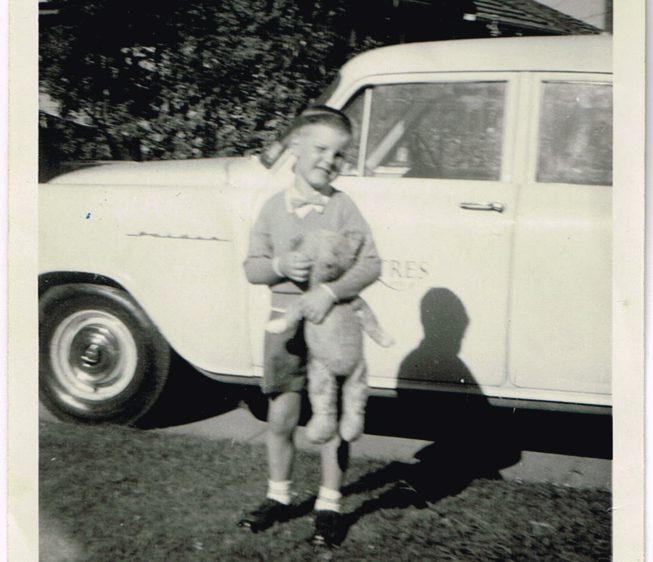 He knew the name, he knew him as one of the mechanics around Melbourne, and I knew a lot of the mutual mutual people that I had even met myself. After all, I had been to the Adler workshop with my grandfather. I remember meeting the head mechanic of that workshop’s son on several occasions as well. In fact, I have a whole host of memories of my own – even though I was very young, from Adler. I arrived at my uncle’s place mid evening, and he cooked up some dinner for me. My uncle in a lot of ways is a lot like myself, and he showed my some of the newer additions to some of his collections. We looked over his 50 something typewriters (almost all of them were standards, would you believe!) his Harley Davidson motorcycles, his GT Falcons, his P!NK memorabilia, and we soon got down to talking about family business. 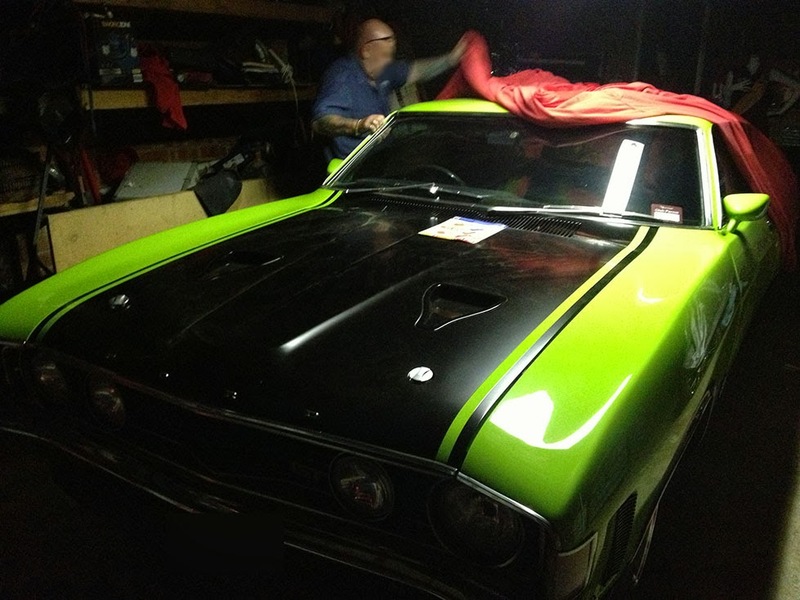 The last of the great V8s. Such a brilliant car! My grandmother passed away 3 years ago, and what little was left of her estate was tucked away in a room at my uncle’s house in Melbourne. So it seemed only logical that I ask him if he had some photos of my grandfather. A few beers were consumed for courage before my uncle delved into the spare room filled to the ceiling with my grandmother’s belongings, and he soon returned with two photo filled shopping bags that had been quickly stuffed with very little care. He back sat down with a bit of an anxious huff, and started to pull photos from the bag. “Do you have any of him at Adler by chance, at the workshop”? I asked casually. “Ay”? My uncle enquired with confusion. “He never worked for Adler. He worked for Remington for 47 years”! Honestly surprised, I then asked him “Really? Why did he drag my sister and I all the time to Adler, and why did he seem to always be mates with all the mechanics from there”? “Oh no, he just went there for parts and stuff. Oh, and he bought heaps of typewriters from there. He used to sell them on to customers. He just went there because the typewriters were cheap and he had some mates there”. I was stunned. I was certain he worked for Adler. Even my own father who would have surely known him for decades of his working life, had talked about him at Adler’s workshops, and I struggled to make any sense of all of this. But the evidence was irrefutable – ‘Scottie’ was a Remington man. Scottie wasn’t actually his name. He immigrated from Scotland in the 20’s, and never lost the accent. If anything, the older he got the thicker the accent became. The nickname ‘Scottie’ apparently stuck very early on, and for some reason – despite there being thousands of immigrants from Scotland in Australia, he seemed to be ‘Scottie’ to pretty much everyone. We shuffled on through the photos and soon came across some images taken from my Grandparent’s wedding. 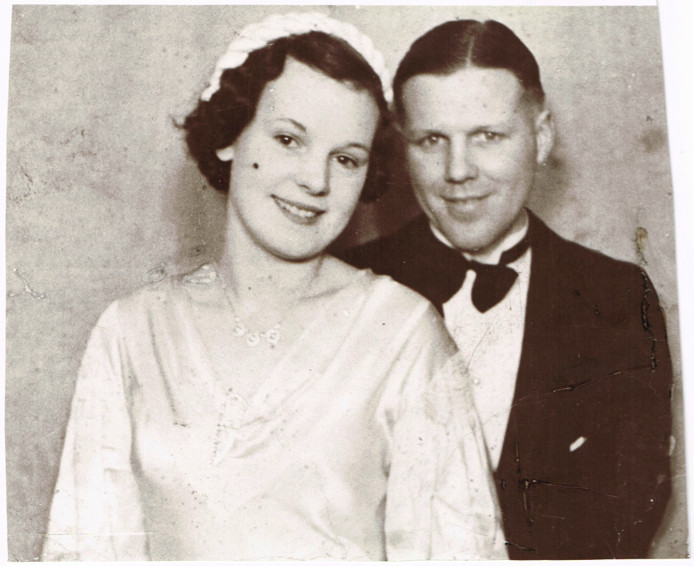 My Grandmother looked astonishingly beautiful, and I realised that I knew very little about my grandparents lives prior to them starting a family. My grandfather was a competitive ballroom dancer, and soccer player in his youth, and in the photographs the dancer in him was obvious, as he appeared incredibly comfortable in his suit. My grandmother also was very graceful in the photographs – but not as relaxed as my grandfather. However she had a pleasant glow of contentment and happiness about her. 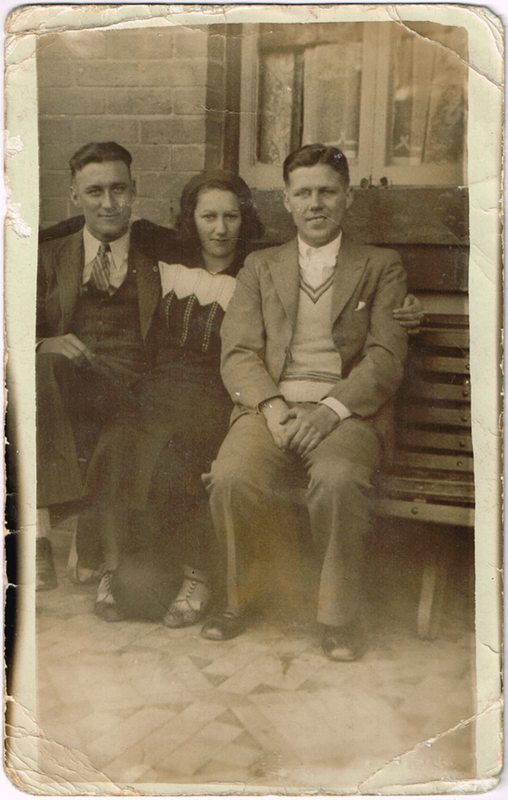 There were a couple of other photos that we just couldn’t place the people in, so I started to ask my uncle about my Grandfather’s own family. But he was to emotional about the photographs to really answer my questions, and he struggled to remember who key people in the photographs were. 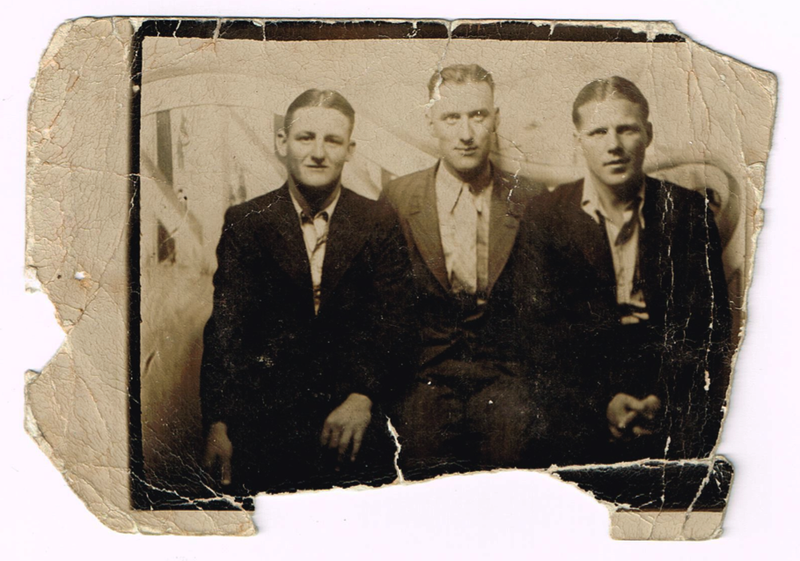 That’s my grandfather ‘ Scottie’ on the right. There was a life in some of these photos that just flowed from them – which gave me something of a feeling about how my grandparents lived their lives. And it really rubbed in how little I knew. I guess it was inevitable though, that my own mother would start appearing in these photos. 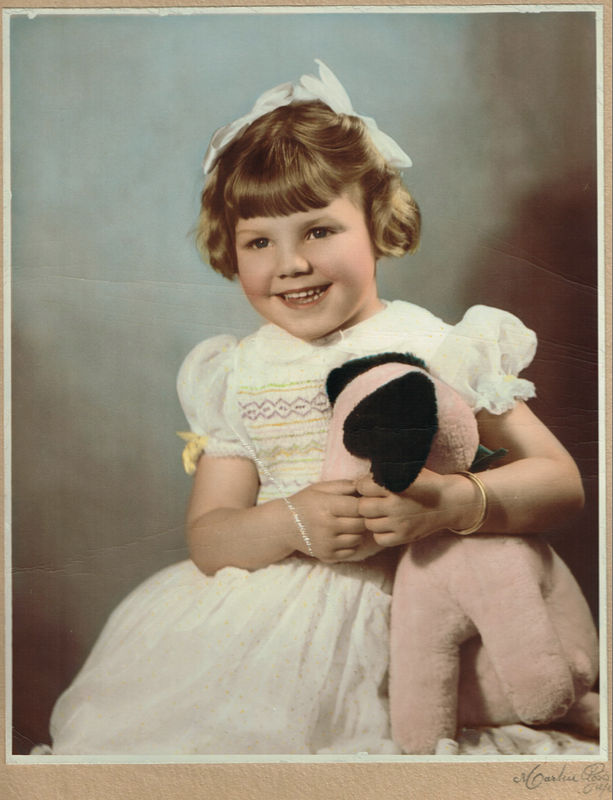 I’d never seen anything of my mother as a child before this, and to be honest I wasn’t prepared for the very mixed feelings that I had about seeing her in these photos. My grandfather and my mother. I have no idea why she is glowing in this scan. Most of my memories of my mother are blurred due to the emotional loading from my mother tragically suffering from Multiple Sclerosis for over 20 years. It is impossible to describe how such a thing impacts on your family, and it becomes very hard to look back into your past and find a lot of happy memories. But they are there – if I look hard enough. 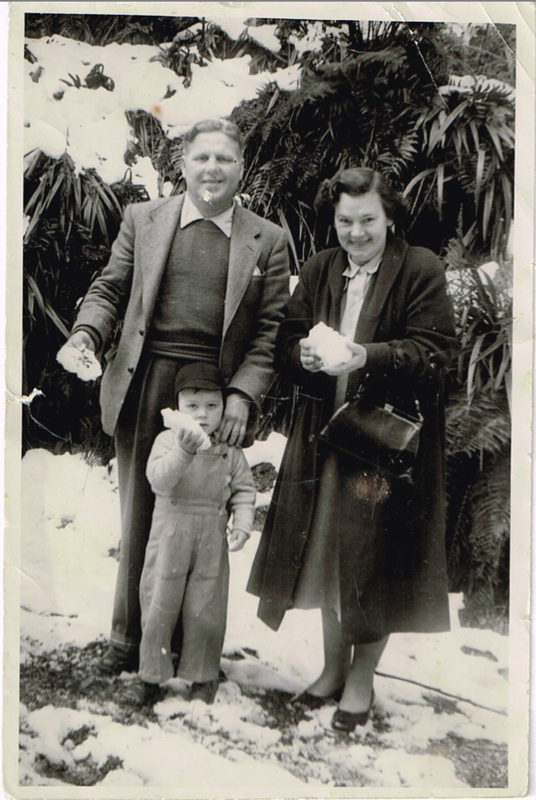 My grandfather passed away in February 2003, and my mother followed three weeks later. I moved to Brisbane, away from Melbourne a year after that. Even now I find my eyes welling up as I write about this. So I’ll just keep this brief. But the world, and the young girl that would later be my mother, in these photos were different. There is a feeling, a feeling of hope for the future and the beauty of living, that I didn’t expect. As a child my mother seemed so adorable. This was a far softer image of her than the woman of my memories, where I see the ferocious fighter who spent years lobbying politicians for better support for the disabled, while she struggled with her own deteriorating body. She was a woman that despite the bad lot she had been handed, was determined to make a difference in life, and held strong beliefs about social justice, and even before she had MS, she was a very strong campaigner for women’s rights amongst other things. 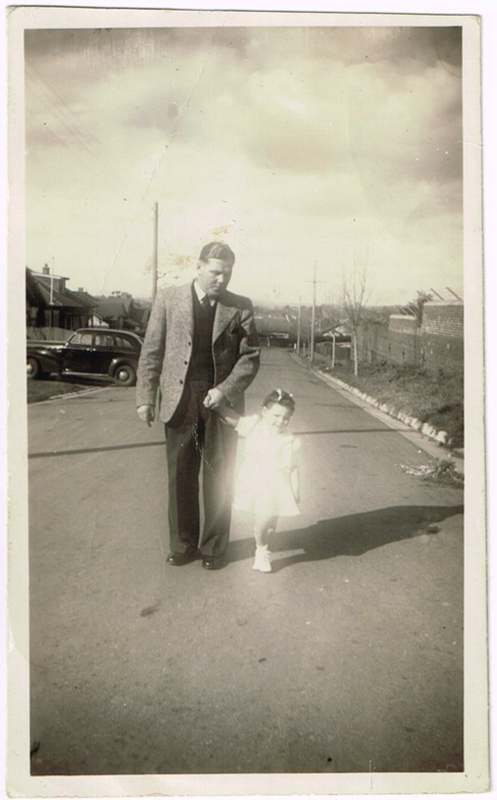 So, in conclusion I have some photos of my grandfather to show John when I next see him, and I even managed to start a little bit of family in-fighting by just asking for these photos. But at least a bit of family fighting is a reminder that I still have a father, a sister and an uncle – and that they still mean a lot to me. ← The Brother that followed me home. “Thank you for sharing” seems like such a trite phrase anymore, but it is heartfelt. I'm sure your post has send many of us back into the past a bit with memories of good times and bad. 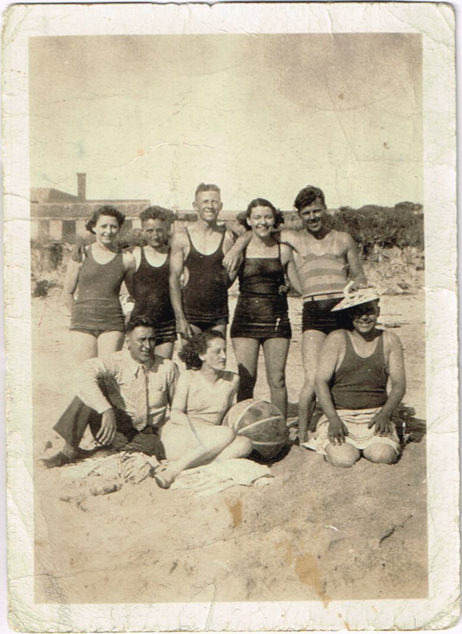 One thing your post has done for me is to instill the resolve to organize some key family photos. Fortunately I have hundreds tucked away on hard drives in our safe deposit box, but none organized in chronological order with the impact of the few you have here. Thanks for sharing. Scott, you should know that your story touches even strangers. I read your blogs, though I don't often have much to say, to add. I just want you to know that your story affects more people than you may realize. This is really well done. Thanks. Yes, I'll echo Michael's sentiments. I have never seen a photo of my grandfather. I don't know what he looked like but my guess is he looked like my dad, whom I bear a passing family resemblance too. But it is interesting to reflect past times of hardship, world wars and what life threw at our forebears that they had to survive – and for a particular, unacknowledged reason – so you could be here today, keeping them alive. I always love to watch old pictures, but with a story attached to it, like in your blogpost it's very moving. It's funny and sad how your own family history can keep so many secrets from you. I know mine has, I even keep some myself. The Adler-Remington thing is just a misunderstanding, which is well explained by your uncle. Nothing to worry about! Must be good to see that your mother at least could have a part of her life without the need to fight and just be. These are wonderful pictures, especially the one with three people on the bench, for me. It is eerie to think of how much we don't know about our own histories and the histories of people we “know.” Thank you. I don't think you ever really realise the impact that a photo has, until it is viewed in another context. Thank you for your kind comments. Sounds like a worthwhile project you have in mind there! Thank you very much for that Michael. That's what I find so moving about these photos. These are lives that have existed outside of mine, yet have such a major impact on my own. It is fascinating and interesting, while being revealing and confronting at the same time. Thanks for that. We all do have unique paths through time, and I find it endlessly interesting. I keep a lot to myself. And oddly, there's not a lot of photographs of me. Thank you for your kind words. Thanks Richard. There's something about that photo particularly that I just can't put a finger on, that makes me want to probe a lot further back into my family's history. I couldn't put it down, and it just had to go on this blog entry. It's always amazing to me what one photo can stir up in our minds. I found a photo of my Father that was taken in the early 1960s and I began to wonder about what life must have been like for him back then. Nice post, Scott. Treasure the memories. Thank you. Rey much Teeritz. I'd imagine your father 's photo would have been quite interesting. Actually, I think I'm almost as ignorant about my own father's life as I am of my mothers.